NoteBurner fails to read iTunes library? Only convert 3 minutes? Why? How to solve the problem of "Conversion Failed" ? What should I pay attention while converting? The output files have several short breaks of silence when played back? 1 or 2 seconds of a random song from iTunes adds to the converted audio? How to Make NoteBurner Work Faster under Mac OS X 10.13 or above? Q1. How to register iTunes DRM Audio Converter? Please refer to this guide to register NoteBurner program effortlessly: How to register NoteBurner programs with registration code provided. First please make sure that you have downloaded the right program. The registration information is case sensitive. And, please do not add blank at the beginning or the end of the word. You can also copy and paste the E-mail and Code into the registration popup dialog. If you are sure that you are running the right program and following the direction but still get the error message, please contact our support team for help. Q3. How to solve the problem that NoteBurner fails to read iTunes library? Firstly, please make sure you have downloaded the music to your computer, and it can play normally in iTunes. If it is the purchased music from iTunes, please make sure your computer is well authorized with the same Apple ID that you used when downloading the iTunes music. Q4. Why the output file is only 3 minutes long? It's the limitation of trial version. After you have bought a single user license, we'll send you a key/code to unlock the limitation. Q5. What kind of audio formats could be converted? Any audio files that could be played on your iTunes, could be converted by iTunes DRM Audio Converter, including Apple Music files, iTunes music and audiobooks, music file you purchased, audio book you bought from Audible, etc. Q6. How to solve the problem of "Conversion Failed"? For this error, we have some suggestion for you, please try and check if it helps to fix this issue. 2. Please make sure the original audio can be played on iTunes normally, and your computer is well authorized with the same Apple ID that you used when downloading those songs from iTunes. 3. Please check whether the problem only happens to individual files, if so, please try to convert them again. 4. For Windows users, please make sure iTunes is closed. Please don't use iTunes while converting. 5. Please check whether is there any external audio device connected with your computer while conversion, including USB, Wi-Fi, Airplay, Bluetooth and HDMI, etc. If so, please disconnect them and retry. 6. For Mac users, please refer to this guide to delete the driver file under "/Library/Audio/Plug-Ins/HAL/MJRecorderDevice.driver", then reboot your Mac and retry. Q7. What should I pay attention while using iTunes DRM Audio Converter? You should quit iTunes before running iTunes DRM Audio Converter, and you'd better don't use iTunes while converting. Any operations on iTunes while converting may affect the result. Q8. Where can I get the converted files? The converted files are stored in the output folder. Click the "History" button in the main interface to find the output audio. The converted files are stored in the output folder. Click the button on the top right of the interface to find the converted audio files. Q9. The output audio quality is unsatisfied, how to improve the output quality? Please update your program to the latest version. If problem persists, please set the output format as MP3 and bitrate as 256kbps to have a try. To customize output format, please click the Setting button. There will be a pop-up window to let you set output settings. If the output quality is still unsatisfied after such settings, please contact our support for further help. Please set the output format as MP3, bitrate as 256kbps and slow down the converting speed to have a try. To customize output settings, please open program preferences by clicking Menu Bar > NoteBurner iTunes DRM Audio Converter > Preferences or directly clicking button on the main interface. Then, set "MP3" as output format, "Medium (256kbps)" as output quality and "5x" or lower as convert speed in the pop-up window. If the output quality is still unsatisfied after such settings, please contact our support for further help. Q10. How to solve the problem that the output files have several short breaks of silence when played back? Q11. How to solve the problem that 1 or 2 seconds of a random song from iTunes library adds to the converted audio? Q12. How to organize the output audio into Artist / Album folders? Before converting, please click the setting button on the top-right corner. And then check the box before the "Keep output folder organized". Q13. How to Make NoteBurner Work Faster under Mac OS X 10.13 or above? As Mac OS X 10.13 (High Sierra) includes new security measures, NoteBurner iTunes DRM Audio Converter only supports converting Apple Music at 1X speed under it with SIP enabled. So in order to convert music files at up to 20X speed, please refer to "How to Make NoteBurner Work Faster under Mac OS X 10.13 or above" to turn SIP off. Q14. What to do if your Mac sound is not working after using NoteBurner? Q15. 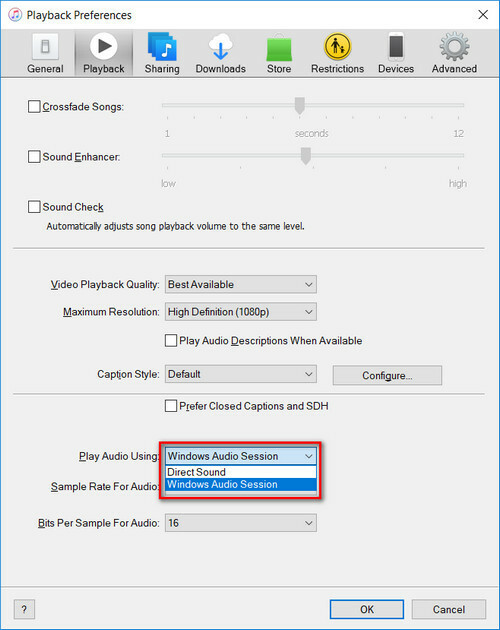 How to do if there is no sound in the output audio on Windows? Please open iTunes Preferences by clicking "Edit >> Preferences" and choose the "Playback", then select "Windows Audio Session" from the drop-down list of "Play Audio Using" and click "OK". After that, close iTunes and launch NoteBurner to convert those songs again.